The price of a gallon of gas is cheaper than at any time in the past six years, with the official U.S. gas price now down to a mere $2.21 per gallon, off almost nine cents from last week’s price, and down $1.50 since the end of June 2014. 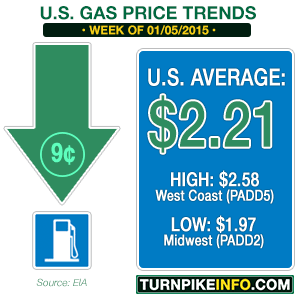 The current pricing is detailed in the weekly gas price survey from the U.S. Energy Information Administration. The regional average gas prices in the Midwest and Gulf Coast states are now officially below $2.00 per gallon, with the Midwest enjoying gas averaging about $1.97 and the Gulf Coast drivers enjoying gasoline at $1.99. The price of gas continues to follow the track of crude oil, which has collapsed under the weight of strong supply and weak overseas demand. West Texas Intermediate crude, WTI, fell below $50 on Monday, triggering a massive stock market selloff. WTI was trading just over $48 per barrel in early Tuesday trading, and the overseas crude, Brent, was trading just above $51. By comparison, both futures indices were trading well above $100 per barrel over the summer, with Brent pushing past the $110 boundary at one point. 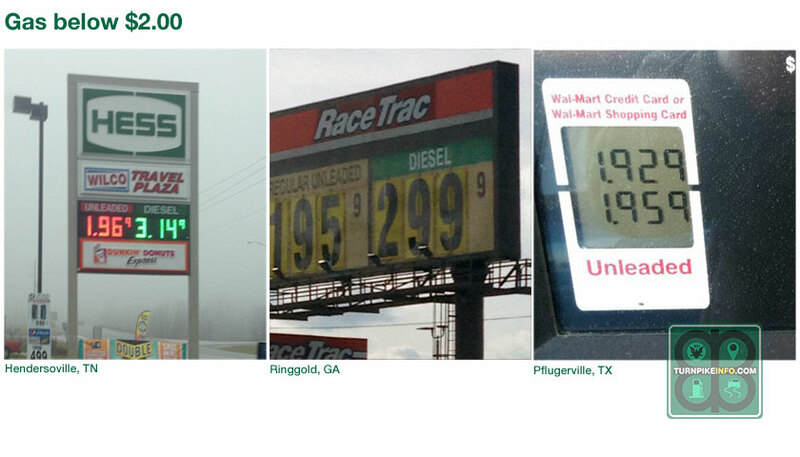 Gas prices are below $2.00 in many states. Photos credits (from left): Shirlice Irick, Ben Irick, Eric Scallion. However, domestic oil production in the U.S., combined with high output from OPEC member states, has resulted in a glut of oil at a time when the broader global economy is slowing. The result is high output and lower demand, translating into very low retail gas prices. However, there is consensus among Arab OPEC nations that crude will return to between $70 and $80 per barrel by the end of the 2015. Reuters quoted unnamed OPEC ministers last week, most of whom agree the current decline in prices will stabilize and “find new equilibrium” by the end of the year. The sources told Reuters the reason they expect a turnaround is that they do not foresee the global economy slipping into a new recession, but rather enduring a momentary period of slowdown before growing once more. In the meantime, the travails of low crude oil prices will remain bad news for producers but good news for American drivers. One motorist in Texas told TurnpikeInfo.com he was able to fill up his small car for only $22, and that was using premium unleaded. For many drivers around the country, the cost of topping off the tank is about 40% lower than it was just six months ago. That savings also translates to the hauling industry. Truckers have been enjoying slowly declining diesel prices for nearly a year, with the declines accelerating in recent weeks. As it stands, the average price of a gallon of diesel is now about $3.14, which is about 75¢ less than just a few short months ago. For a tractor-trailer with a 150-gallon tank, that translates into $113 in savings for every fill-up. Region by region, the area with the highest diesel prices continues to be the New England and Central Atlantic states, where the cost is $3.29 and $3.30, respectively. California has the most expensive diesel at $3.34 per gallon.